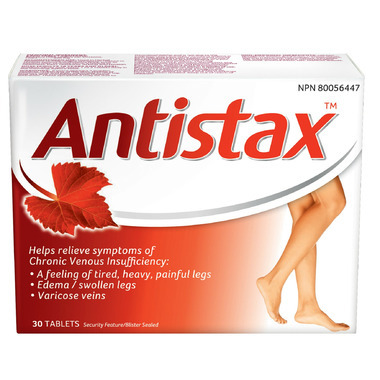 Antistax, taken daily, uses red vine leaf to help reduce lower leg edema and improve lower leg blood flow in CVI, leaving your legs healthy and feeling great. Used in Herbal Medicine to help relieve symptoms related to chronic venous insufficiency (CVI), such as swollen legs, varicose veins, a feeling of heaviness, pain, tiredness, itching and tension. Dosage: (Adults 18 years and older) Swallow whole with water 1 to 2 tablets daily in the morning, before food. Non-medicinal ingredients: Calcium phosphate dibasic anhydrous, colloidal silicon dioxide, croscarmellose sodium, crospovidone, glyceryl tristearate, hypromellose, iron oxide red, magnesium stearate, microcrystalline cellulose, purified water, talc, titanium dioxide. Warnings: If there appears a sudden swelling, reddening of the skin, feeling of tension, heat and pain, especially in one leg, stop use and immediately seek medical attention. These symptoms may be due to thrombophlebitis and is not due to the treatment with Antistax™. Persistent edema in both legs may have other causes and should be investigated by your doctor. Do not use if you are pregnant or breastfeeding or if you have a hypersensitivity to any of the ingredients in the product. You may experience nausea, stomach discomfort and other digestive system symptoms, generalized pruritic rash, urticaria and hypersensitivity. Consult your doctor if there is inadequate symptomatic response within 6 weeks of use. If symptoms persist or worsen or for use beyond 12 weeks, consult a healthcare practitioner. Interactions and effects on fertility and ability to drive and use machines have not been studied. Keep out of reach of children. Like so many others with leg and feet cramps I have tried everything. This product may help others but it did not work for me. on to the next!